The season for celebration is here! The Italian Chamber of Commerce and its Young Professionals are pleased to announce that the Fourth Edition of the Official Christmas Dinner with The Young Professionals is back! 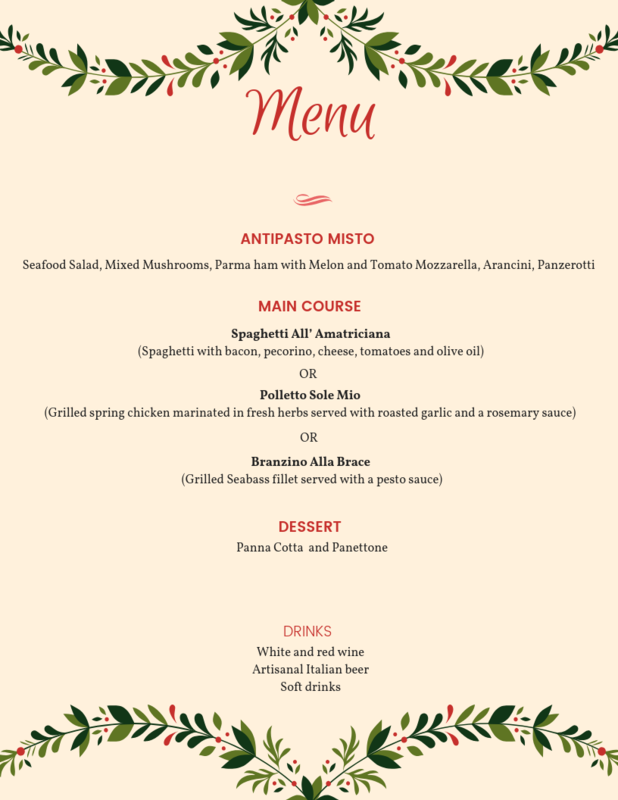 Join us for a great night of holiday cheers while enjoying a 3-course Italian menu by Sole Mio, free flow of white and red wine and beer sponsored by BEVI Hong Kong. At the end of the dinner don’t miss the chance to win an Italian gift by participating in our lucky draw. Seats are limited, RSVP now to save your spot! The Italian Young Professionals committee is a group dedicated to promoting the business growth of its members through different projects and activities. Its members are all young professionals (under 35) who are taking their first steps in the business world and need to build the necessary skills to have a successful path. Sole Mio is a hidden gem in the heart of Soho. For over 16 years Sole Mio represents the very best Italian cuisine that Soho has to offer. Located on the upper ground floor at 51 Elgin Street, Sole Mio makes a great entertainment space that provides privacy in a convenient and central location. Popular amongst corporates for lunch sets, happy hour and events, Sole Mio caters to parties of all sizes. From antipasti to pizzas, pasta to desserts – Sole Mio brings you a memorable dining experience with recipes that have stood the test of time. Indulge in a 3-course meal, accompanies by a boutique selection of well-chosen wines from all over the world.